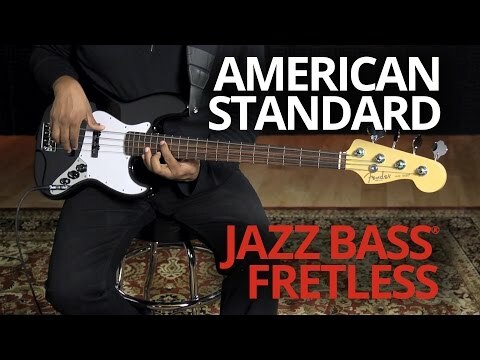 The Fender Standard Fretless Jazz Bass sets the definitive sound and looks of an electric bass guitar. An offset, contoured Alder body with .. The Fender Standard Fretless Jazz Bass sets the definitive sound and looks of an electric bass guitar. An offset, contoured Alder body with maple neck forms the foundation for superb sustain and clarity. Since 1951, Leo Fender's Bass Guitar designs have inspired musicians around the world. They have undergone very few refinements over the decades - a testament to their tried and tested formula for success. The Standard Jazz Bass retains the timeless, streamlined aesthetics with a few modern tweaks to help improve performance, tone and playability. With a slightly brighter and richer midrange tone compared to the Precision model, The Standard Jazz bass is a real musicians favourite. An offset waist alder body gives the Jazz bass the perfect foundation for great tone, but doesn't weigh a ton. For several hours of gigging or recording, your back will appreciate the lightweight yet resonant body of the Standard Jazz! Modern upgrades include a shielded body cavity, which helps provide low-noise performance. Traditionally, at the time Leo Fender conceived the original Jazz Bass, he didn't know that guitars wern't meant to have maple necks. However, his ignorance paid dividends, and the trademark blonde Maple neck has become a trademark feature of classic Fender guitars. Comfortable to play and a great aid to tone, the Jazz Bass becomes a true pick-up-and-play instrument. Courtesy of a Standard single-coil Bass Pickup at the Bridge and Single-Coil Bass Pickup at the Neck, the Jazz Bass is capable of super smooth, rich low end, but with the bite and growl at the top end for more melodic and aggressive players. Produced at the Fender factory in Baja California, Mexico, the Standard Jazz Bass has won the hearts of bass guitarists around the world for its comfort, tone and no-nonsense stage appeal. Shop today at the PMT House of Rock - Fender Premier Showcase dealer with stores around the UK for expert advice, guidance and demonstration available.